Direction unity of Man and thing. 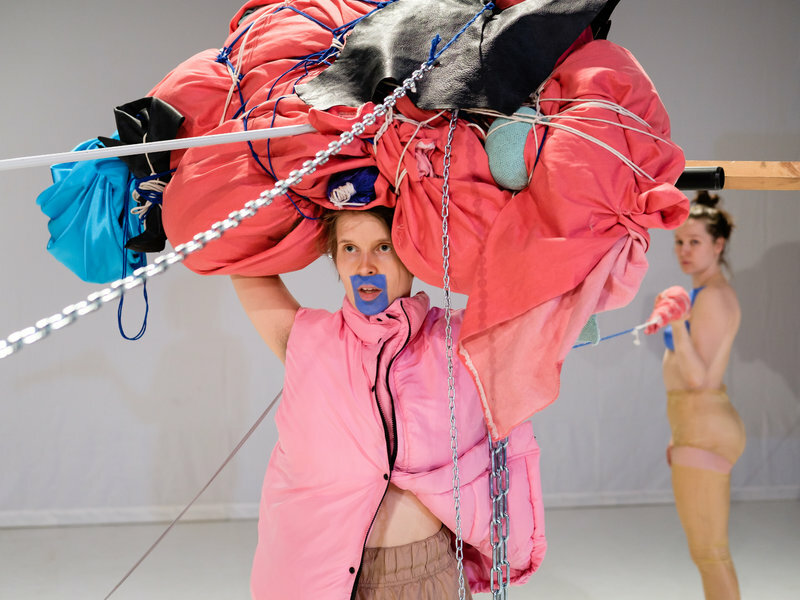 The Finnish dancer and choreographer Sonja Jokiniemi makes hybrid performances that hang somewhere in between sculpture, painting and stage art. Her meticulous attention for décor and visual elements in her work makes for almost miniature landscapes. She always starts from her own drawings and her fascination for language and the connection of Man and thing. In Blab she zooms in on the chaos of the world and how we create order in it. 'Blab literally means chatter, babble, meaningless talk : Jokiniemi goes in search of zones where language fails and Man is part of something not human. Jokiniemi wants to think beyond categories and goes in the direction of the unknown : direction unity of Man and thing. On stage three bodies move that seek out each other and their surroundings as a supplement or someone to talk to : the essence of Blab lies in this very search, and the merging of the different elements. Sonja Jokiniemi studied dance at the Laban Centre in London and DasArts in Amsterdam. She attracted attention with the solos hmm and RRRRR : performances in which she already examined the potential of being 'different' and the mechanisms of language. This project has received support from the TelepART Mobility Support Platform. The TelepART project’s mission is to promote artistic collaboration between Finland and the Benelux countries. / Het evenement heeft TelepART steun gekregen. Het aanvraagplatform voor TelepART is gericht op zowel Finse kunstenaars als kunstenaars in Benelux landen die reizen tussen Finland en de Benelux.